Looking for a spooky Halloween snack ? Check out this adorable witch that we recently shot for The Popcorn Board. It’s easy to make & fun for kids —you just need grocery store ingredients and your imagination. Trick or Treat! Here’s the recipe, courtesy of The Popcorn Board. Spread a sheet of wax (or parchment) paper over a work surface and place the wafer cookies on it. Spray a large mixing bowl with cooking spray and place popcorn inside. In a medium saucepan, melt butter over low heat. Stir in marshmallows and gelatin dessert powder until marshmallows are melted and mixture is smooth. If desired, adjust color with a drop or 2 of food color. Pour over popcorn and mix well until coated. Spray hands with cooking spray and press firmly to form into 8 balls. Place balls on 8 of the wafer cookies. 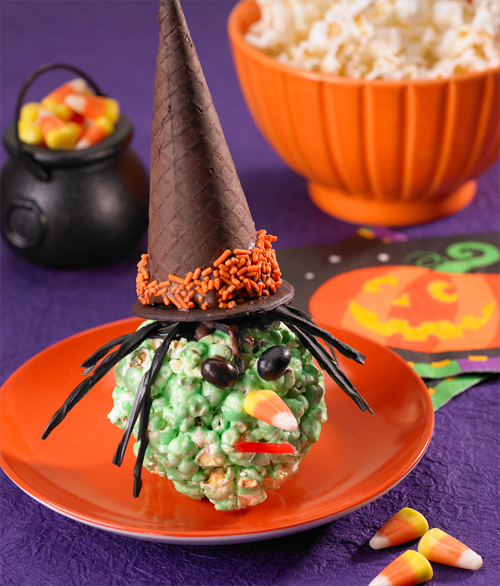 Press candy decorations into popcorn balls to form eyes, nose and mouth. Place chocolate chips in a small microwave-safe bowl. Cover and heat for 10 seconds. Stir chocolate to aid melting. Repeat as needed until chocolate is melted and smooth. Spoon about 1/2 teaspoon melted chocolate onto the top of each popcorn ball. Press a few licorice strings into chocolate to form ‘hair’. Make hats: dip cone edges into melted chocolate and then into orange sugar sprinkles. Using melted chocolate as the “glue,” attach cones to remaining wafer cookies to form hat with brim. Place hats onto popcorn balls, again using melted chocolate as the “glue.” Allow chocolate to set for about 45 minutes before serving. Serve or seal individually in plastic wrap for storage.